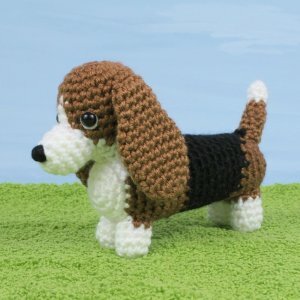 An original crochet amigurumi Basset Hound dog pattern from the AmiDogs range by June Gilbank. Note: This pattern is worked in brown, white and black to make a tricolour basset. To simplify it, you can make a two-coloured basset (brown and white) by omitting the black and just using brown wherever the pattern specifies to use black. Date Added: 03/13/2015 by Janet Y. Date Added: 02/28/2014 by Heather L.
Date Added: 04/30/2013 by Chrisie M.
Date Added: 09/30/2012 by kimberly m.
This is an absolutely fabulous design. The colors match my dog named, Shorty. Date Added: 05/10/2012 by Sarah H.
Date Added: 04/22/2012 by Karen A. Date Added: 09/24/2011 by Judy C.